Look at what Cigarette Smoke does to electronics! It’s no secret that cigarette smoke is harmful to your health, but recently I was working on a few computers that had multiple symptoms. Running slow, overheating, even causing the trackpad to fail on a Mac Laptop. All of those little “dust specks” are the remnants of smoke inhalation by the laptop. Click on these pictures if you want a closeup “gross out”, but in the laptop, the tar has actually been seeping into the unit, warming up, and then “balling up” inside of the unit. 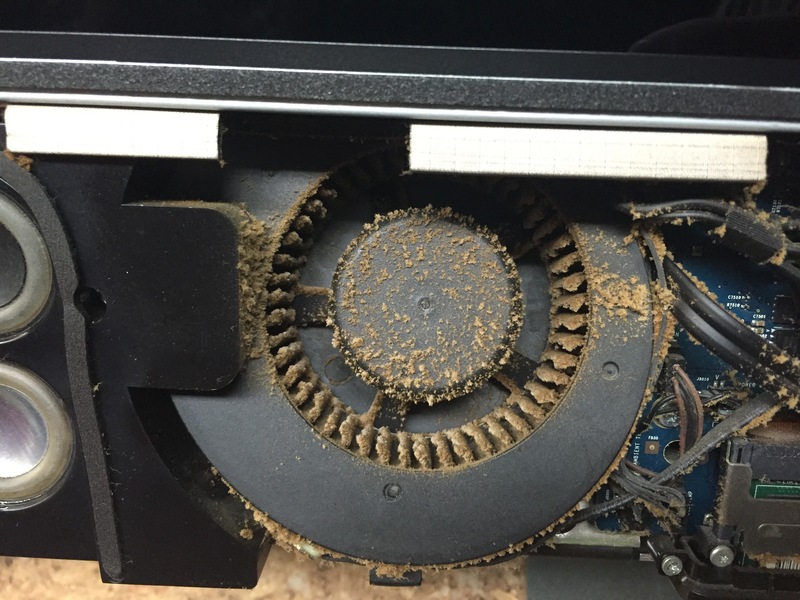 In both cases these devices needed to be completely stripped down and cleaned…and then they worked! In fact the report on the laptop was that the trackpad wasn’t functioning; so I used three different cleaners to strip the surface of the tar buildup (just where you touch the trackpad), and it was working again. It was simply just too dirty for it to work! 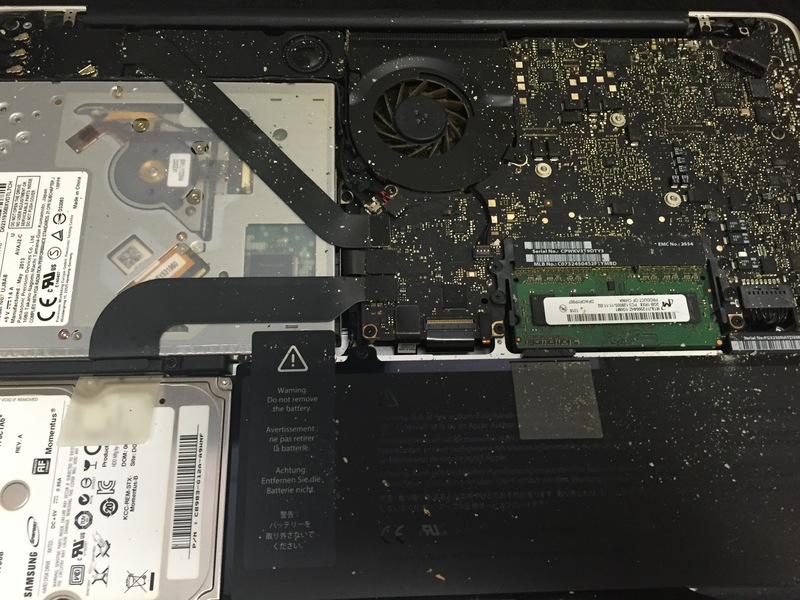 HINT: Clean your laptop trackpad often! That’s a good point; maybe I should call Mike Rowe and apply for that hit TV show, “Dirty Jobs”. This qualifies! A little sightseeing doesn’t hurt. I’m out here in Colorado this week working with my crew and making a changes and working with Chris our store manager. After my trip to the Otterbox headquarters last night, I decided to jump on my motorcycle – I brought it with me, I knew this might happen;-) I headed up into the mountains while there was still some daylight left. This spot, marked by the Gregory Monument, is near the city limits of Central City and Black Hawk. The area was originally called Gregory’s Diggings, but very soon became known as Mountain City. Did you know Central City nearly became the Colorado state capital? It is also home to the Gilpin County Museum, Teller House and the world famous Central City Opera. 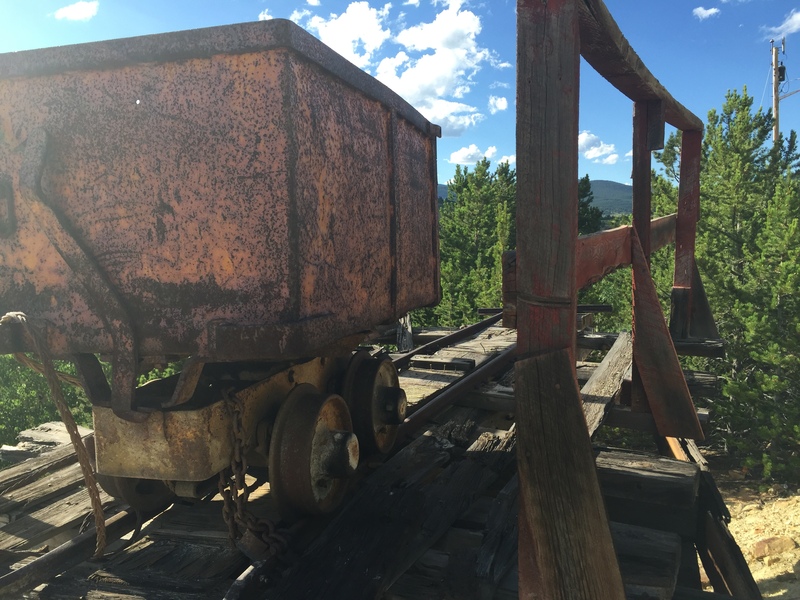 It’s an old mine ore car that’s been sitting for a hundred years or more. I don’t know why, but these types of things really appeal to me. It was so quiet it was kind of creepy…and I kept looking over my shoulder! Once I got back to lay down for the night, I got 10 hours of solid sleep and feel like a million bucks this morning. Must be that mountain air, right? Well, I’m back in the office here in Lakewood this morning, so if you stop by I’ll be sure to say hello. Thanks for reading! 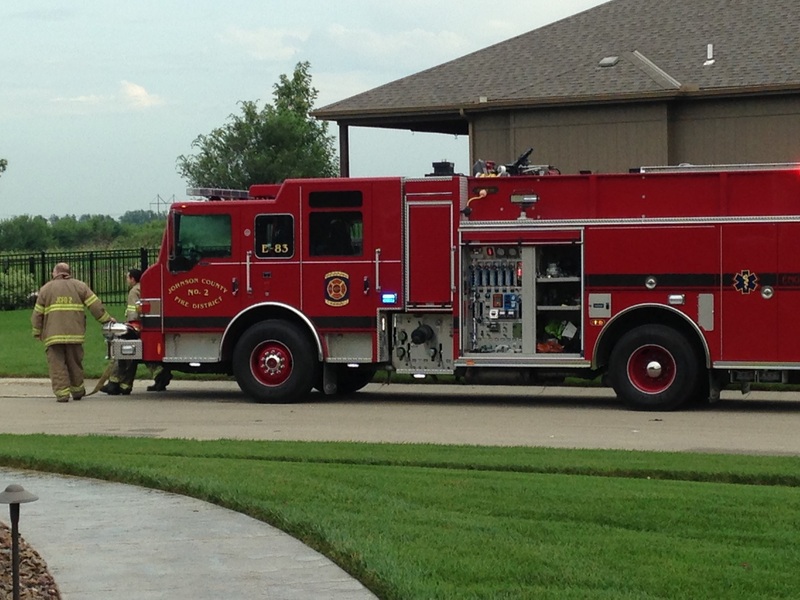 EMERGENCY at the Arter house. Well, kind of. But then she got a knock on the door – by a fireman – who said that they were closing the street and to stay indoors because these guys cracked the gas main that was underground. Yikes, aren’t there precautions that can be taken? Like “Calling before you dig?”. 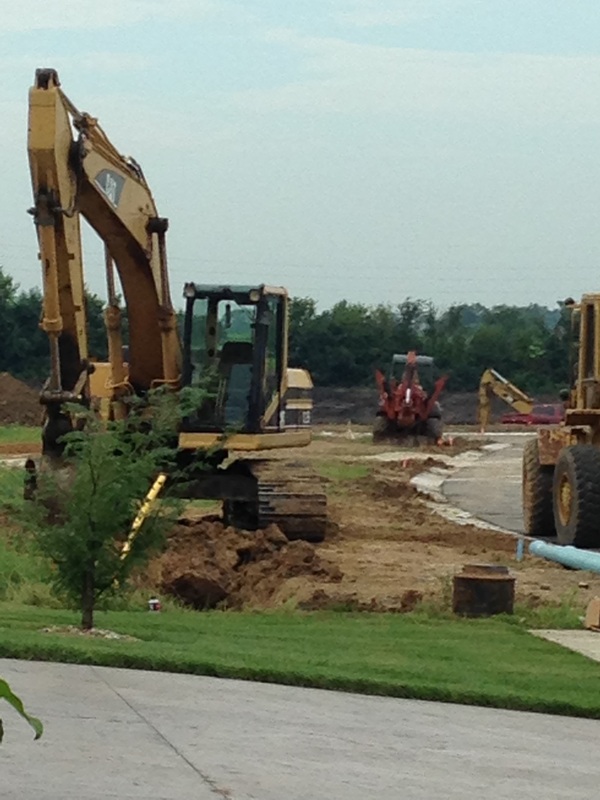 They got the situation under control, fixed the gas line, and corrected their mistake. However at the same time, they CUT MY INTERNET LINE! This is the real emergency. Gas line, smass line. Cut the fiber cable? Holy bananas!! Apple Watch Repairs becoming a reality. Good morning Apple Watch fans – or maybe not – I’m not even sure if the Apple Watch is something that I can get in to. The Apple Watch is easily the best-selling smartwatch ever…but that’s not saying a lot. The question that Apple and all smartwatch manufacturers have had to answer when trying to push their devices to people is, “Is this thing actually useful?” From the start, many people said that the Apple Watch would survive based on the 3rd party Apps that we have all come to know and love. The New York Times points out that 15 of the 20 most popular iPhone apps have not made Apple Watch versions of their software yet, a list that includes Facebook. In fact Adam Mosseri, who oversees Facebook’s news feed, tells the Times that while Facebook has been taking a look at the Apple Watch, it still hasn’t found a compelling way to make its mobile app work on a wrist-based computer. So while the demand for repairs hasn’t been overwhelming at this point, we are coming online with our service set shortly here at Mission Repair. I’m personally not a huge Apple Watch fan especially due to the price; and with some of the high end models that reach above the $10,000 mark…I still think that a timeless Rolex or Breitling would ultimately carry more value even if they don’t come with the Angry Birds App. Yes, we repair a lot of iPhones, but did you know that we have the best computer technicians in the industry? It’s true. Our “1 pound” devices seem to really overwhelm our repair centers at every location; clearly this country needs it’s cell phones repaired. However, we’ve been on a huge run of laptop computers lately. Maybe it’s that time of year, just before summer break hits, but we are receiving more than average numbers of Apple and PC laptops alike. However that doesn’t stop my customers from calling in and getting any information that they need. At each of our locations, we have PC technicians on staff to help with broken screens, hard drive upgrades, memory installations and LOTS of keyboard replacements. I don’t know what it is about the keyboard on some of these Dell units, but I should probably buy extras. So give us a call 866-638-8402 or shoot us an email sales@missionrepair.com and we’ll do what we can to help you out. Yes, we get calls about virus removal, about every Windows laptop needs it, but it’s good to make sure that your virus removal software is up to date. Go check that now, or buy yourself an MacBook! I will begin preparations now for the biggest discounts that you’ve ever seen, and we will have lots of fun at each of our locations on this momentus day. I have so many stats, so much data, and have had so much fun being a professional blogger that it’s really exciting to know that soon my blog will reach the 1 Million mark and I’m just going to share my excitement and thanks to everyone. That second question is simple. Create a blog on a free blog site, name it, and start typing. In fact, I follow several blogs including past Mission Repair customers, vendors, and others that I just admire. If you’ve got a blog that you author or if I can help you get started on your own blog, let me know and I’ll be happy to be a part of your blog circle. Just reply to post in the comments section and I’m there! So the big day is coming…the “Mission Repair Million Celebration”…we get about 10,000 new readers each month, so at this pace sometime in October we should be there – whether that ends up being true or not, I’m not going to worry about it. It will happen when it happens, but rest assured that I’ll be right here to share in the big day. It’s that time of year again! Spring is just around the corner and Daylight Savings time is this Sunday, March 8th. While losing an hour of sleep isn’t my cup of tea I do enjoy this time of year and I’m ready for the warmer weather. Don’t forget to change your clocks this weekend and “Spring Forward”! It’s also a great time to stop by your local Mission Repair store because NOW through Sunday at Midnight we’re offering 10% off ANY repair service!